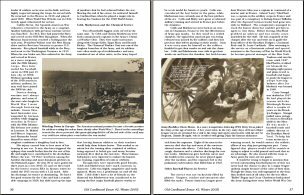 The cover and the table of contents for Issue #2 are shown below. 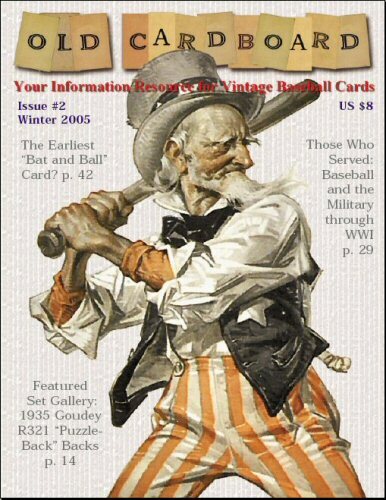 1) "Baseball in Wartime: A Tribute to Those Who Served thru WWI" by Chris Stufflestreet. 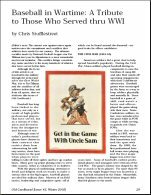 Our cover feature for this issue is dedicated to athletes from all sports that have served our country in wartime. 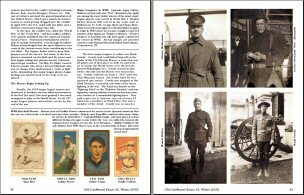 The article is amply illustrated with vintage baseball cards and also includes individual images of Christy Mathewson, Grover Alexander, Branch Rickey and Hank Gowdy--each in his WWI military uniform. 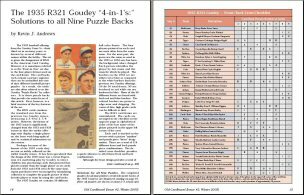 2) "1935 Goudey '4-in-1’s:' Solutions to all Nine Puzzle Backs" by Kevin Andrews. A look at this popular mid-1930s set focusing on its "puzzle backs." All nine of the puzzles are "solved" and presented as composit images. Interestingly, it takes twice as many different cards (72) to complete the nine puzzles than it takes to complete the set of 36 card fronts. 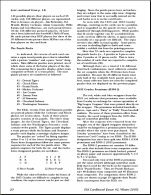 Table shows master checklist of all 114 front-back combinations. 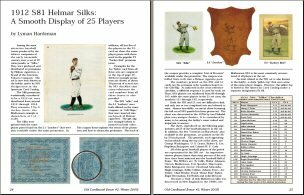 3) "1912 S81 Helmar Silks: A Smooth Display of 25 Players" by Lyman Hardeman. An overview of these most attractive but difficult to find premiums issued by Helmar brand cigarettes. 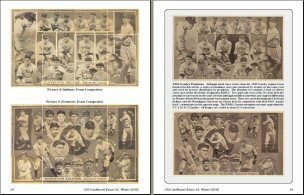 A detailed checklist cross-references all of the cards from the S81 issue with the same poses found in the L1 "Leathers" and the T3 "Turkey Reds." 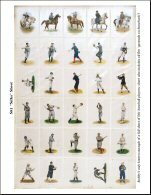 The only known full sheet of S81 silks is also displayed). 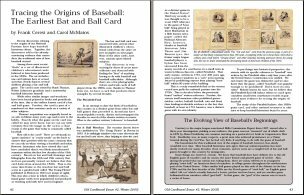 4) "Tracing the Origins of Baseball: The Earliest Bat and Ball Card" by Frank Ceresi and Carol McMains. 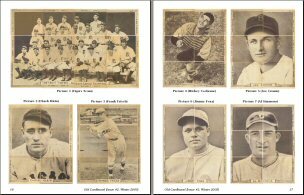 Summary of the most recent historical discoveries relating to the origins of the game of baseball. 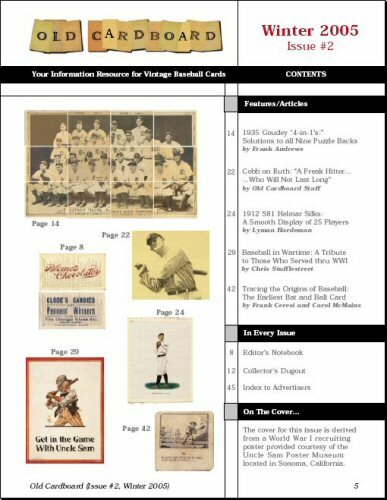 Includes the image of a card now owned by Walter Johnson's grandson Hank Thomas and considered to be the earliest "bat and ball" card known. 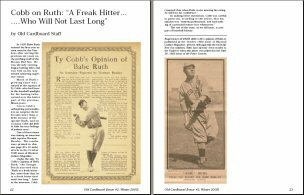 5) "Cobb on Ruth: 'A Freak Hitter......Who Will Not Last Long'" by Old Cardboard Staff. 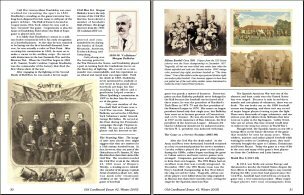 A brief but tantalizing interview with Ty Cobb that was first published in the October 1920 issue of Physical Culture Magazine. During the interview, the Georgia Peach asserted that "Ruth is a freak hitter--but, more than that, he is a freak hitter that won’t last long." Illustrated with contemporary images of Cobb (printed in the article itself) and of Ruth (from the June 26, 1920 issue of the Police Gazette).